What I gathered is that some people who booked with Bell Travel Service end up boarding the wrong bus. When they arrive at the airport they are too jet lagged to get on the right bus. It's either that or they get on at the wrong time. They are not enjoying the service that they have been promised. So be sure to check your itinerary before you leave for Bangkok. It is confirmed that your 1 seat will be reserved on 14:00 bus from Suvarnabhumi airport to Pattaya on February 13th. The fare is 200 baht/person and shall be paid to our staff on the bus. It includes company's transportation to Soi Honey Inn. At the airport, please make sure to look for our staff with "Bell Travel Service" sign because there are many "Pattaya" signs that are not ours. Many of our passengers followed them and they were dropped off by the street in Pattaya. Our company also provides the transportation from Pattaya to Bangkok. 1. Bus schedule from Pattaya to Suvarnabhumi airport is 6:00/9:00/11:00/13:00/15:00/17:00/19:00. The fare to Suvarnabhumi is 200 baht/person and it includes pick-up service from your hotel. 2. Bus schedule from Pattaya to hotels in Bangkok is 9:00, 13:00 and 17:00. The fare is 350 baht/person and it includes pick-up and drop-off services from your hotel to your destination in both cities. The bus will have a quick stop at Suvarnabhumi airport and then goes to Bangkok office to transfer all passengers to minivans. Then all passengers will be dropped-off at their hotels. It will take about 3 hours to hotel in Bangkok. If you have planed for your return trip, you can reserve the seat at the same time via this e-mail. We look forward to serving you soon. And if you have more questions, please feel free to contact me via this e-mail. Our bus schedule from Suvarnabhumi airport to Pattaya is 8:00/10:00/12:00/14:00/16:00/18:00. The fare is 150 baht per person and it shall be paid to our staff on the bus. This includes company's transportation to your hotel (downtown Pattaya area). At Suvarnabhumi airport, our staff will be waiting for you about 30 minutes before the bus departure time on Level 1, Gate#7 next to Tourist Police counter, holding a small sign of "Pattaya - Bell Travel Service". Then she will lead you to the bus which is parked right outside the terminal. Her contact number is +66(0)89-449-8843. 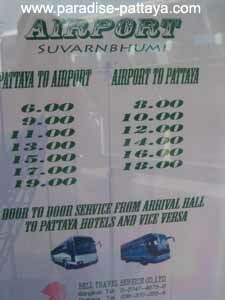 The bus takes approximately 2 hours between the airport and Pattaya. 1. Bus schedule from Pattaya to Suvarnabhumi airport is 6:00/9:00/11:00/13:00/15:00/17:00/19:00. The fare to Suvarnabhumi is 150 baht/person and it includes pick-up service from your hotel. 2. Bus schedule from Pattaya to hotels in Bangkok is 9:00, 13:00 and 17:00. The fare is 300 baht/person and it includes pick-up and drop-off services from your hotel to your destination in both cities. All passengers need to reserve their seats in advance. It would be great if you can reserve your seats at least 7 days prior to your travel date. Please provide your name, number of seats to be reserved, date and time of your journey and your destination?s name. Then we will review whether it is in our service hours and service area then we will confirm your reservation as soon as possible. You prepare your Pattaya Travel plans now that you know what a Bell Travel email looks like.